​​​​​​​​​​​​​​​​​​​Welcome to the Presidio! This inspiring setting at the Golden Gate has a remarkable history and a fascinating present as a unique national park that welcomes all. Please come for a visit! The Presidio is where San Francisco began. This inspiring setting at the Golden Gate was home to native peoples for thousands of years. ​​​​​​​​​​​​​​​​​In 1776, Spain established a military fort on this land. After winning its independence from Spain in 1821, Mexico controlled the post and established a new pueblo nearby called Yerba Buena (later known as the city of San Francisco). In 1846 the Presidio became a U.S. Army post. Generations of soldiers passed through its gates, serving our nation around the world. ​​​​​​​​​​​​​​​​​The Army departed in 1994, and the Presidio became a national park site. Today, the Presidio welcomes all with its beauty, nature, history, recreation, and family activities. Begin your day by getting oriented at the Presidio Visitor Center. Then learn about the park's rich history at the Presidio Officers' Club​, a museum and cultural center. The Presidio Visitor Center is a gateway for discovery, using inspiring video, engaging exhibitry, interactive digitial tools, and knowledgeable staff to help visitors uncover the incredible array of experiences that are possible in the 1,500-acre Presidio of San Francisco. It is THE launching pad for incredible park adventures! What Can I Do in the Presidio? 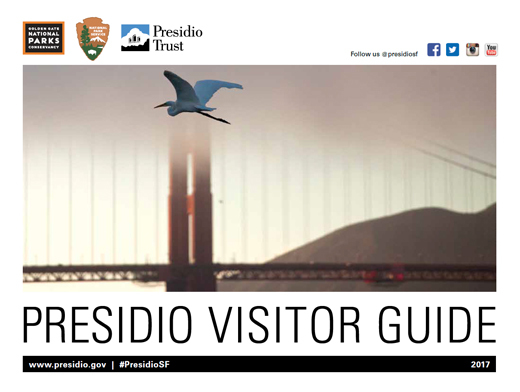 Use the Presidio Visitor Guide​ to plan your day in the park.